The Air Series AF120 LED Purple Quiet Edition High Airflow 120 mm Fan from Corsair provides two case fans for cooling your computer. They perform optimally in unrestricted spaces with at least 1.2" (3 cm) of clearance. The AF120 is ideal for mounting at the rear or at the top of your PC case as exhaust fans for your motherboard, CPU, graphics cards, and other components that fill the case with heat. The AF120 works equally well as unrestricted intake fans for areas like side panels or bottom intakes. The AF120 Quiet Edition also runs at a low noise level of 21 dBA without sacrificing cooling performance. Moreover, these fans illuminate the inside of your computer with a purple color. 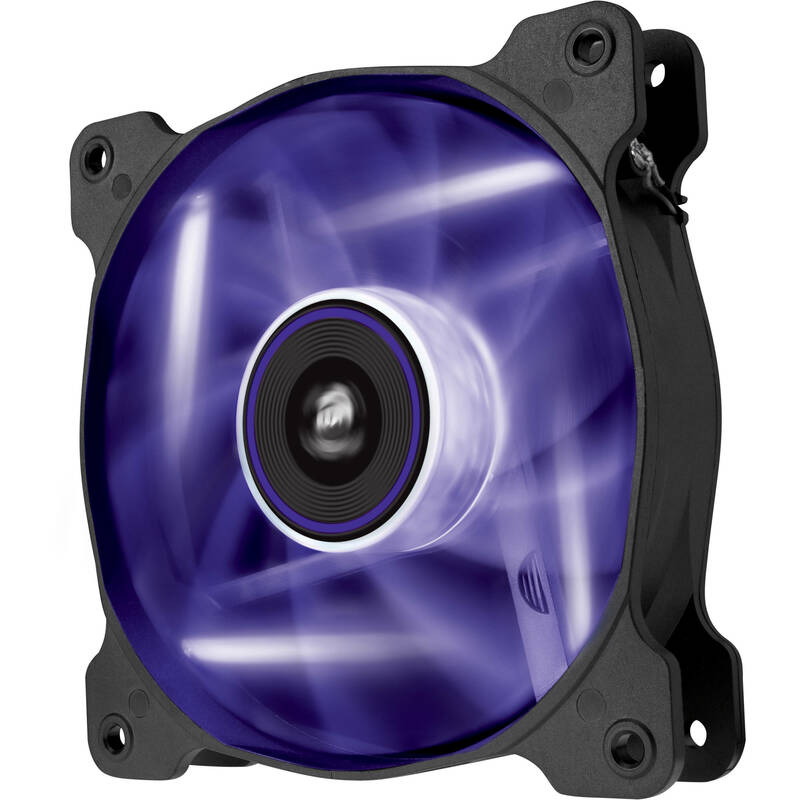 Box Dimensions (LxWxH) 6.614 x 4.882 x 2.205"
Air Series AF120 LED Purple Quiet Edition High Airflow 120 mm Fan (Twin Pack) is rated 4.6 out of 5 by 12. Rated 4 out of 5 by Mercyfate from Lookin good! Got the fans hooked up, and the led's match the ones in my case and the whole thing glows red.With 2 pwn splitters and a few screws,I was up and running in no time.B+H makes ordering easy and pickup was a cinch. Would go this route again. Rated 4 out of 5 by A.Vatan from good for the price... If the fans are used with motherboard conntroller application they work silently. But when the speed of tge fan reaches over 1200 rpm, I can say that they are loud. Rated 3 out of 5 by wesley from Good product but.. Product is good working condition, but hard to install, screw holes not threaded so took me a long time and needs to exert a lot of force to screw in. Rated 5 out of 5 by Richard D. from Great case fans These fans work really well even at lower settings, they move alot of air, and were easy to install, the pictures do them justice as well. Rated 5 out of 5 by Ali from Very quite I just installed this in my Mini itx it's very quite, it also cools my case really well, The price is also great for 2 fans. Rated 5 out of 5 by Joe from Fans With Serious Air Flow Well designed blades pushing lots of air quietly. Nice LED lights to add bling. The Corsair Air Series AF120 LED Red Quiet Edition High Airflow has to be mounted on a case.